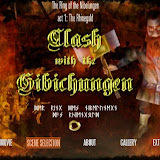 Clash with the Gibichungen The Directors cut tells the tale of the first encounter from Alberich and his Nibelungen with the sinister and ruthless Gibichungen race. Basically this cinematic was my first ever “go” to create a longer movie in the Age of mythology game. It was part of the Nibelungen AoM TT campaign. Although the campaign contains many more cinematics this one was probably the most complex to set up and trigger. Of course later AoM TT movies like for example the Corruptor or especially the cinematics from Wonders of the Deep and from the Tower of Babylon are technical but also visual far better done this Clash movie still has a special place for me personal as it stays the first bigger one…so thats why i decided to record it and update it with new music/sound score and voice acting. And ofcourse I was curious if I could turn it all into a full feature DVD video…..anyway its just hobby stuff so I hope you enjoy it. Check also the The Ring of the Nibelungen act1: the Rhinegold AoM TT campaign page. All the Clash with the Gibichungen DVD video screenshots can be found in the Age of Mythology The Clash with the Gibichungen gallery. The gallery contains also low quality examples of the DVD cover artworks which are included in the download pack for the DVD video. Find the screenhsots gallery for the Ring of the Nibelungen act 1: The Rhinegold campaign here. If you have a DVD player or a game console like the X Box which can switch between both video formats and a television set which can handle that…then it does not matter wich version you download. The High quality artworks for DVD cover, booklet and disc are included in both download packs….so you can give your personal version of this DVD the final touch. For the DVD version you need a DVD burner on your system. Simply unzip the Iso file and burn this Iso file on a DVD. After this you can watch the DVD back on your Television set with any modern DVD player…and ofcourse on any modern DVD player on your computer system or console device like X-Box.